For all those who wish to indulge yourself with a delicious tea, fruit-flavored and with beneficial effects for the line. 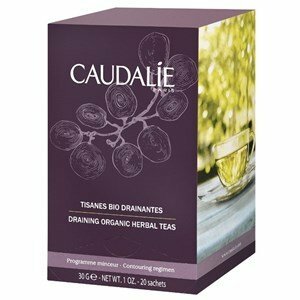 Tasty mixture of 5 100% organic plants, these herbal teas draining were exclusively biological created for the "Tisanaria" of Vinothérapie ® Spas. Accelerate the elimination of water and toxins, providing an immediate sense of well-being. Products from organic farming. Ecocert Certified F32600 SAS. Take a sachet of tea to infuse in a cup of water, boil and enjoy hot or cold, or put 3 sachets in an infusion in 1.5 liter of water, even cold.